Ms. U. S. of A. 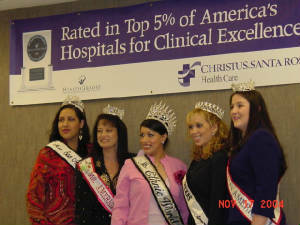 All the queens at the Santa Rosa Children's Hospital in San Antonio. I am with Miss Teen San Antonio Ethnic World (Jessica Gomez), Ms. Ethnic World (Yvette Parrish), Mrs. Texas American Beauty (Elizabeth Aleman) and Miss Austin American Ambassador (Lacey Cannon). 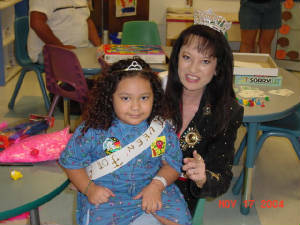 Elizabeth Aleman (Mrs. Texas American Beauty) and I at the Santa Rosa Children's Hospital, taking a moment while visiting the children. This little girl and I had a great time at the Santa Rosa Children's Hosptial in San Antonio, where they are treating her. She was so excited to be crowned queen for a day.